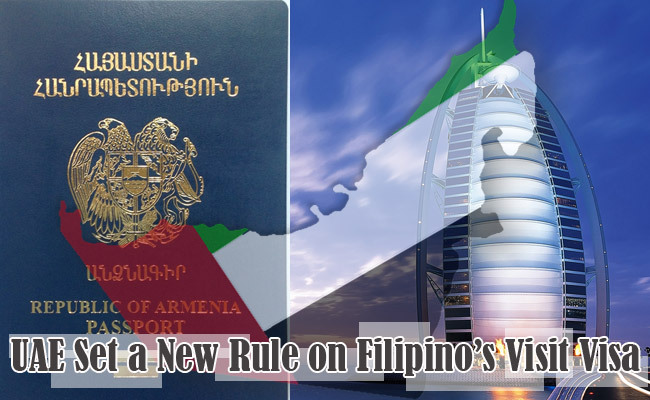 Filipinos who are planning to travel in United Arab Emirates through their visit visa and are also sponsoring their relatives to get a job will now have a hard time as the UAE has a stricter rule about their visit visa. Based on the Philippine Embassy , they can only sponsor their relatives such as parent, siblings, child, nephews, nieces, uncle, aunt, spouse and in laws. It was stated by Giovanni Palec , a Deputy Consulate - General of UAE , that the relatives of Filipinos needs to be authenticated such as marriage or birth certificate to prove if they really are. If you are sponsoring a relative, you are responsible to his/her daily needs like food and shelter. They also need to have a monthly salary of DH3500 (PHP44,200) hence Filipino workers like Domestic Helpers or Drivers won’t have the capability to sponsor their relatives because they don’t earn that much according to Gulf News. Palec added that their employers won’t allow their nannies to bring their relatives at home. UAE become stricter now because there were cases that some uses visit visa to help their friends find a job there. They were using this opportunity to become domestic helpers or drivers. It was also set to avoid Human Trafficking and Illegal Recruitment. Hiring of Filipina maids in UAE right now are suspended that is why many were doing illegal by sponsorship. Palec said that there is a huge increase of Filipino Tourists in UAE to work but nowadays many of them got into trouble. Learning this, Nhel Morona ,a coordinator of Migrante UAE, which is an NGO Advocate for the rights of OFW’s state that it will not lessen human trafficking and Filipinos have the freedom to travel as a tourist because it was written in the Philippine Constitution.